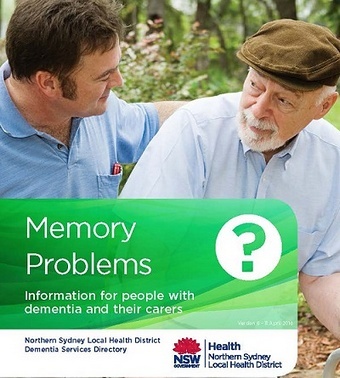 A new informative guide for health professionals, people with dementia and their carers has been produced by the Northern Sydney Dementia Partnership*. The Memory Problems brochure provides educational information on dementia including the stages of dementia and what to expect, local support groups, services to help at home for both person with dementia and their carer, financial advice, legal matters, planning for the future and palliative care services. GPs are encourage to display the MEMORY PROBLEMS brochure in their practice and make it available to patients and families who would benefit from learning more. Practices in the Northern Sydney region will be provided with 50 copies and a reorder form. For practices that subscribe to InfoMed the brochures will be delivered automatically. Enquiries: Please contact the Primary Care Advancement and Integration team e: PCAIT@snhn.org.au or ph: 9432 8250. *The Northern Sydney Dementia Partnership is a collaboration between Northern Sydney Local Health District, Sydney North Health Network, Alzheimer’s Australia and CCNB Northern Sydney Regional Dementia Planner.